Drink special Bordeaux at Kendall's Brasserie and five other Patina restaurants through March 31st, 2010. The opening of the Bordeaux Reserve Cellar: It happened a couple of weeks back at the Patina restaurants. The cellar will stay open for just two months more, through March 31st. And, coming soon, an excellent reason to pop a cork: Valentine's Day. When we say Patina restaurants... We're talking the Pinots: Cafe Pinot, Pinot Bistro, and Pinot Provence. 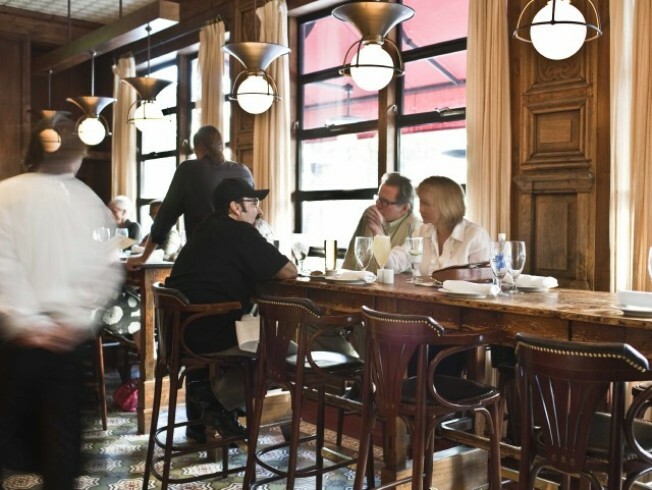 Plus, Kendall's Brasserie, Nick + Stef's Steakhouse, and Catal Restaurant & Uva Bar. The wines: There are 15 in the special group; the years are 2000, 2003, and 2005 (if you're a Bordeaux buff, we'll guess you just sighed and/or cocked an eyebrow there). All hail from the Patina reserve cellar. We had no idea Patina had a reserve cellar, but we suppose we should have known. Now we do. Help on hand: Knowledgeable sommeliers will help you pair your steak or duck with that perfect bottle. Momentous occasion and all. Prices: The bottles begin at $79, and run up to $495. Also, note: some of the Patina places will be going by the glass, so ask when you make reservations. Reservations: Valentine's Day ahead. A special wine deal on. We'd get on this, if you're going to get on this. One more thing: The Patina people say any "unsold wine will be returned to the vault." We'd been swooning a bit over the "reserve cellar" concept, but "vault" is even more exclusive and under-ground-ier. Don't let your wine, the wine you should be drinking, get re-stowed for some future person who is not you to enjoy.